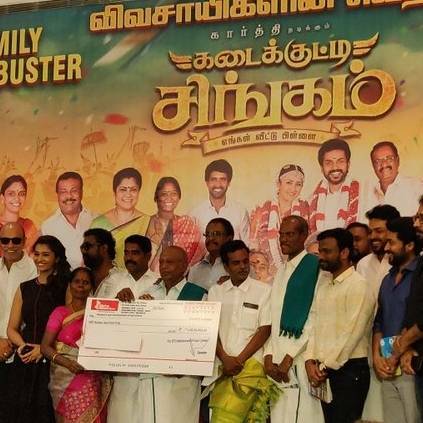 On July 13, Suriya's 2D Entertainments big production, Kadaikutty Singam starring Karthi, Sayyeshaa, Priya Bhavanishankar, Sathyaraj, Soori and a host of other actors opened to positive reviews and good response from audiences all over Tamil Nadu. According to theater owners, the film is still running packed houses with families rushing in to catch the triumphant family drama film. Following this, the whole team of Kadaikutty Singam has arrived at a popular hotel in Chennai for the success meet. Shakthivelan, the distributor of the film has gifted gold chains to Suriya, Karthi, Pandiraj and Rajsekar Pandian. Now, during the success meet program, actor-producer Suriya, on behalf of 2D Entertainments has presented Rs.1 crore for the Research and Development of Agriculture. This is a massive amount for a noble and contemporary cause. Kadaikutty Singam talks about the improvement of agriculture and the sustainability of farming. Karthi plays a farmer and brings to the foray, the importance of farmers in today's world. Hats off to Suriya, Karthi and 2D Entertainment for this excellent initiative. People looking for online information on Kadai Kutty Singam, Karthi, Pandiraj, Suriya will find this news story useful.